Numero uno problem for people worldwide. 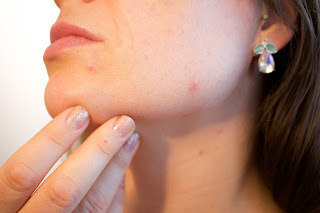 Yes call it pimples or Acne or eruptions, it’s a small inflamed papule. They can occur in clusters or standalone. Commonly known to attack during puberty, when there are hormonal imbalances. This imbalance causes sebaceous glands to oversecreate oil that accumulates and causes infection in skin pores. 1. Do NOT touch, rub or irritate affected skin area. 2. Do NOT exfoliate your skin in hopes of removing pimples. It will damage and worsen the situation. 3. Do use any mild cleansers for cleaning affected area. But clean with a very soft and gentle touch. 4. Do use antibacterial soaps or cleansers containing Benzoyl Peroxide or Salicylic acid. This will cause bacteria to die. 5. Do visit a specialist, some cases require a medical treatment. 6. Drink lots of water. Hydrated body flushes out toxins easily resulting in a better skin. Avoid soda,tea and coffee. 7. Do use a water based moisturizer. 8. Do avoid any kind of makeup which can cause infection to accelerate. 9. Do avoid stress and get enough sleep. This will keep you hormonal balance intact. 10. Do NOT pop the pimple. it will worsen the situation by infecting nearby skin. Numerous researches and scientific studies have shown that a healthy and balanced diet composed of green leafy vegetables together with fruits can work wonders for your skin. Have more to add to above list. Let us know in comments below.